Delicious food has always been held in high regard in Azerbaijan. Residents always praise the uniqueness of Azerbaijani cuisine, while guests fall in love at first bite. Azerbaijan serves no exception to the old adage that breakfast is the most important meal of the day, and Azerbaijan’s unparalleled breakfast choices allow it to stand out on its among regional fare. For this reason, Azerbaijan’s Ministry of Education recently unveiled the newly patented Azerbaijani breakfast brand. The presentation was held for general managers of 4 and 5 star hotels operating in Baku, the Ministry said. “The Ministry of Culture and Tourism has already patented the brand in the Copyright Agency and developed quality control rules for the Azerbaijani Breakfast,” the Ministry reported. 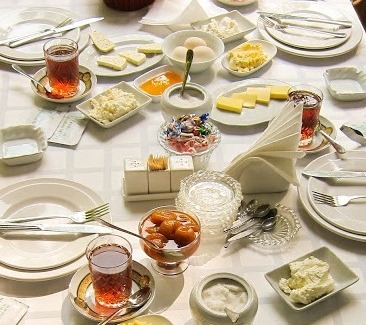 Previously,the Tourism Ministry had stated that traditional Azerbaijani breakfast options would be introduced in hotels in June during the inaugural European Games. The decision to register the brand was aimed at promoting Azerbaijani national cuisine and improve hotel quality. Azerbaijani breakfast options will now be compulsory in hotels throughout the country for tourists to enjoy. The European Games will serve as a means to promote delicious and nutritious Azerbaijani cuisine to the European palate. Azerbaijanis hope that food options could help expand tourism by word of mouth. Over 17 days,, the Azerbaijani capital will host roughly 6,000 athletes from 50 countries. Some 20 sports will be held for Baku 2015, 16 of which are Olympic, and 12 of them licensed for Rio 2016 Olympic Games.